The series of IRIR Encounters was launched in January with a meeting with Dorin Tudoran. 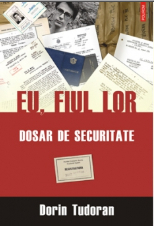 The publishing of his document book I, their son – a Securitate file (Eu, fiul lor – Dosar de Securitate) (Polirom) was one of last year’s main editorial events in Romania. The book consists of a selection of secret police documents about Dorin Tudoran from 1976-1986. It is, actually, not o book by Dorin Tudoran, but a book written by Securitate about Dorin Tudoran. “Not I wrote this book, it wrote me” – as Dorin Tudoran himself puts it. Dorin Tudoran was one of the rather few Romanian intellectuals who risked the open and uncompromising protest against Ceaușescu’s dictatorship. The encounter with Dorin Tudoran took place at the Institute, Bd. N. Bălcescu 21, entrance B, 4th floor. Speakers were Daniel Cristea Enache, Radu Călin Cristea, Liviu Antonesei, Silviu Lupescu (Polirom) and Dorin Tudoran.